The National tour of South Pacific sweeps into the Kravis Center this week. This grand musical hadn't been seen on Broadway for an entire generation when Bartlett Sher mounted his revival in 2008. Bartlett Sher directs a cast that includes Jason hower, Carmen Cusack, Gerry Becker, Genson Blimline, Christina Carrera, Anderson Davis, Sumie Maeda, CJ Palma, Peter Rini, Rusty Ross, Matthew Saldivar, Keala Settle, Christopher Carl, Eric L. Christian, Jacqueline Colmer, Mike Everiste, Kate Fahrner, Nicholas Galbraith, Alexis B. Holt, Chad Jennings, Christopher Johnstone, Kristie Kerwin, Jodie Kimura, Joe Langworth, Maxine Linehan, Diane Phelan, John Pinot Jr., Travis Robertson, Josh Rouah, Tally Sessions, Kristen J. Smith, Matt Stokes, Gregory Williams, and Victor J. Wisehart. It's not easy to make a musical so familiar that most people can hum every tune come alive so that it seems as though everything is happening for the first time. But that's true of the Bartlett Sher-helmed Lincoln Center Theater production of South Pacific playing at the Kravis Center. At its heart is an electric couple: the American hick Nellie Forbush, played winningly by Carmen Cusack, and the dashing French plantation owner Emile de Becque, portrayed by a big-voiced Jason Howard. The choreography is crisp and inventive. The sets — especially the bamboo-like screens that roll up and down and capture magical lighting effects — are simple but seductively atmospheric. Above all, the voices do not disappoint. Cusack's sunny soprano is fluid and controlled, Howard's baritone resonant and rich, and Davis' tenor clear and muscular. The choruses are brawny and disciplined. The orchestra is a full-blooded band, not a couple of instrumentalists cushioned in electronic effects. Hap Erstein reviewed for the Palm Beach ArtsPaper and the Palm Beach Post. But it only counts once! ...the glory of this reverential, but hardly museum-like, revival has arrived at the Kravis Center with its theatrical power very much intact. This production has no recognizable names*, but it is exceptionally well-cast. Carmen Cusack, who has been toiling for the past two years in green makeup in various companies of Wicked, is a sublime “knucklehead” Nellie, vocally very reminiscent of Mary Martin, who originated the role. As is the tradition, Emile comes from the world of opera, but Jason Howard has the acting chops -- as well as the lung power -- to embody the character completely. Michael Yeargan’s tropical scenic design still impresses and you will love the way Donald Holder’s lighting hits the backdrop and Bali Ha’i magically appears out of the mist and clouds. ...you will regret it if you do not see this production this week. 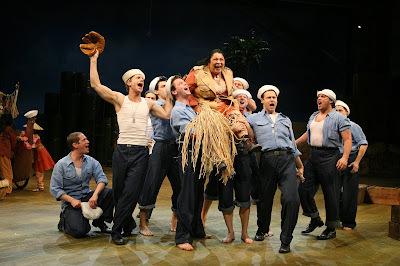 South Pacific plays through this Sunday only at the Kravis Center: don't miss it! * Well, some of us recognize Tally Sessions from Beauty and the Beast, Urinetown, Flloyd Collins, and The Spitfire Grill.